Tarazod Films & Media LLC: It’s Here! Mad City Chickens is Now on DVD! 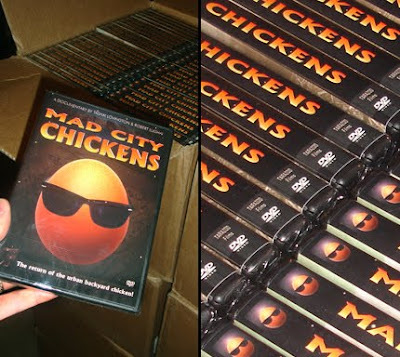 Mad City Chickens is finally on DVD! Order it from our tarazod.com shop. Three years in the making, the 79 minute documentary is a sometimes wacky, sometimes serious look at the people who keep urban chickens in their backyards. From chicken experts and authors to a rescued landfill hen or an inexperienced family that decides to take the poultry plunge—and even a mad scientist and giant hen take to the streets—it’s a humorous and heartfelt trip through the world of backyard chickendom. The city will never be the same again!